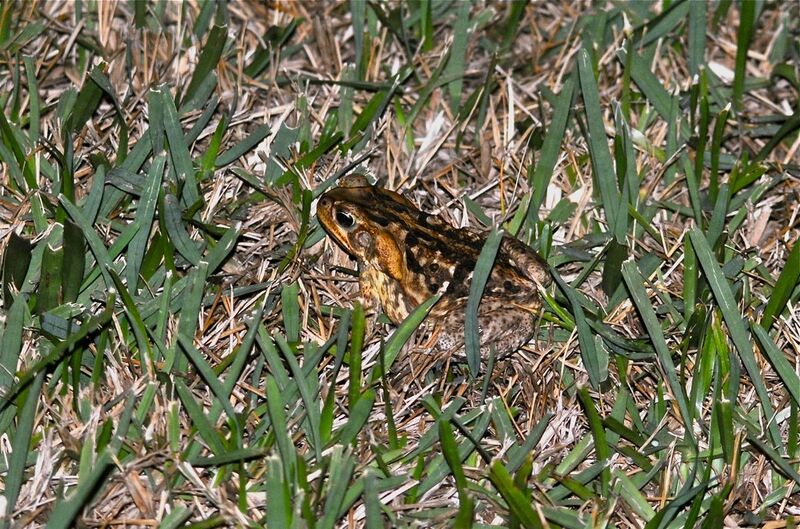 Giant toad, photographed in western Delray Beach, Palm Beach County, in November 2013. Of all Florida's exotic imports, the giant toad, bufo marinus, has got to rank among the nastiest. It is nasty to handle, can kill your cat or dog, and is a voracious consumer of native frogs and toads. The perfect pet. Well, somebody thought so. Then again, someone thought the Burmese python was the perfect pet before it began swallowing the Everglades whole. Actually, the toad's history in Florida begins as a field hand of sorts. It is a native of Central and South Americas, from the Amazon to the Rio Grande Valley. During the 1930s, it was released in Florida's cane fields to control bugs devouring crops, but they disappeared within a year. The toads, that is. They were dispersed several times more, with the same result. Then, in 1955, a pet dealer imported the toads through Miami Airport. In the process, 100 of them got away, and this nightmare of a creature has called Florida home ever since. It's now found in 21 counties, says the Florida Fish and Wildlife Conservation Commission, and spreading. You might call them the raccoons of the amphibian world. if their regular food are in short supply, they'll resort to eating pet food and even garbage. They breed in canals and stagnant water; they'll eat other frogs and toads, but they are toxic to mammals and snakes that might see them as a meal. Even their eggs are toxic to tadpoles of other frogs. 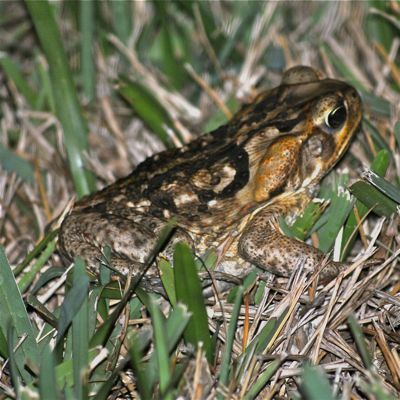 The giant toad is the largest frog or toad found in Florida, growing to six inches long. 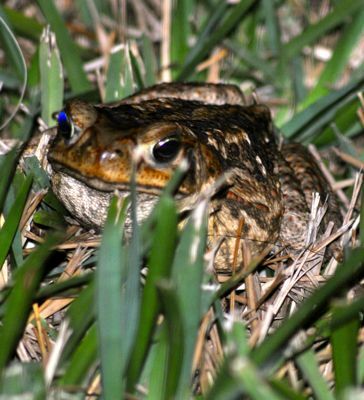 It's similar to the native southern toad, Bufo terrestris, but is larger. 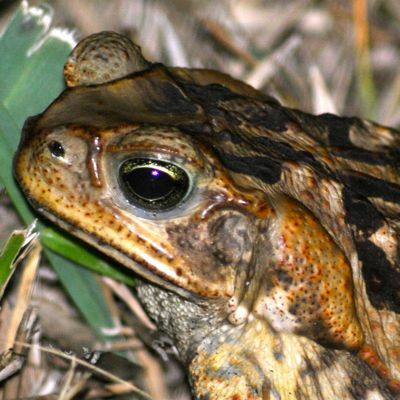 The southern toad also has ridges on its head; the giant toad doesn't. 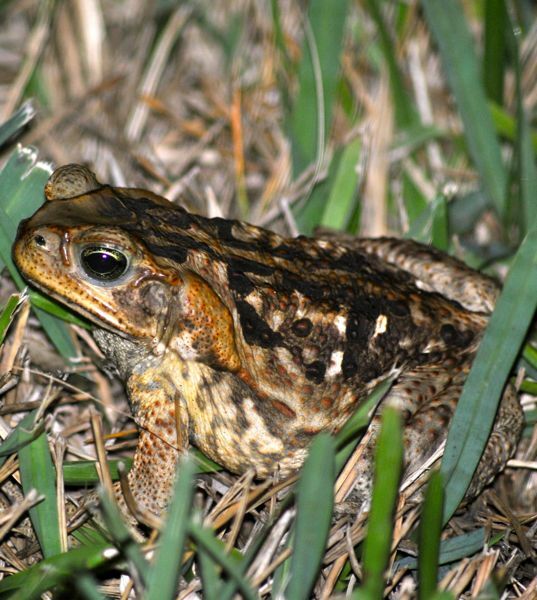 Giant toads are nocturnal animals. They are also terrestrial, but like all amphibians, they need water to reproduce. Clutches of as many as 17,000 eggs are laid in canals, ditches, ponds, streams and temporary pools of freshwater. As noted above, the eggs are poisonous, as are the tadpoles, giving the giant toad a huge advantage over native species. It prefers open areas with minimal cover — your lawn will do just fine, as will the neighborhood park. They spend daylight hours under cover — boards, logs and other items. Giant toads do not like dense vegetation. Giant toads can be found in Australia and the Philippines, Papua New Guinea, Japan, Tawain, the Caribbean and a good chunk of the Pacific Basin, including Hawaii. 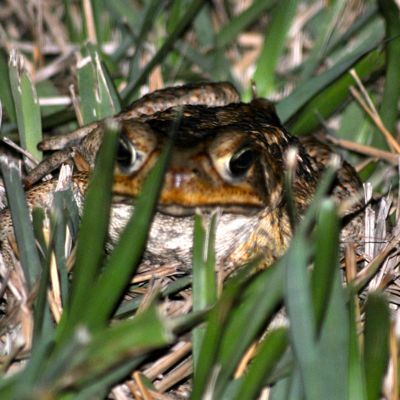 In many of these places, the toads were imported to control sugar cane pests, though failing as they did in Florida. A taxonomic note: these animals are also known as Rhinella marinus, apparently the new scientific name. They are members of Bufonidae, the frog family. Other names include marine toad, Dominican toad and cane toad.